Keith Aulie and Dan Miguel show off a couple of Lloyd Lake lakers. 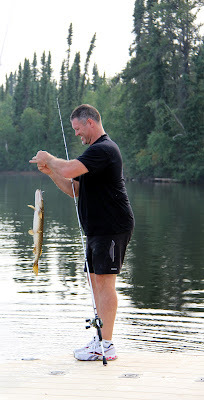 NHL star Owen Nolan smiles over yet another pike caught off the dock. This weekend, Lloyd Lake Lodge hosted contest prize winner, Jeff Cigan and his buddy Andrew McBride at the lodge. As part of their prize, they fished with NHL stars Owen Nolan and Keith Aulie; Patrick Walsh from Outdoor Canada; and Dan Miguel from National Prostaff. Patrick and Dan did a great job documenting the group's fishing exploits. Check out their blog posts for more photos and stories. Thanks for the fishing and the stories, gentlemen. Tight lines!